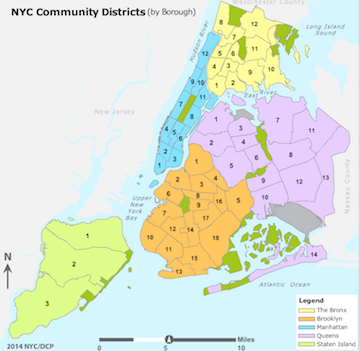 59 community boards in NYC. Each has up to 50 unsalaried members, appointed by borough president. 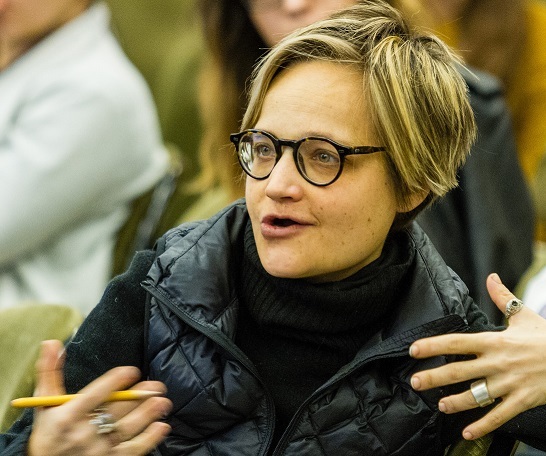 Has committees, holds monthly meetings and public hearings. Plays advisory role in issues involving community welfare, including city budget. District manager (salaried position) appointed by board. 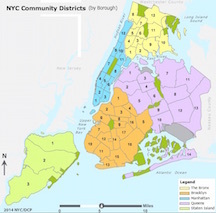 NYC Community Data Portal is a gateway to community district profiles, which include data for a CD, community statements of need, and projects and proposals in the CD. This icon at the top of a Community District Profile links to demographic data like race and age, as well housing, economic, and social data for a CD. The New York City Census FactFinder provides easy access to Census data for New York City. To search, first choose the type of geographic area you want (census tract or Neighborhood Tabulation Area). Then pick your location. You can search by address, intersection, place of interest, census tract, subway station, or neighborhood.